The EyeWire is based on the images that were acquired at the Max Planck Institute for Medical Research in Heidelberg, Germany. This dataset, known as E2198, was the basis of Wiring specificity in the Direction-Selectivity Circuit of the Retina. The source retina was obtained from a dark-adapted adult wild-type (C57BL/6) mouse. The researchers measured both neural activity and connectivity in the same retina by applying two imaging methods one after the other: two-photon microscopy (2P) and serial block-face scanning electron microscopy (SBFSEM). Nowadays it is common to estimate the rate of neural spiking by imaging intracellular calcium concentration. This estimate makes sense because each spike is followed by an influx of calcium through voltage-sensitive calcium channels. Calcium concentration can be imaged using 2P after loading cells with a dye (e.g. Oregon Green BAPTA) that changes its fluorescence as a function of calcium concentration. In this way, Briggman et al. imaged the responses of ganglion cells with 2P while applying visual stimuli to an adult mouse retina. The white spots in the image to the right are the ganglion cell bodies, and the dark branches are blood vessels. 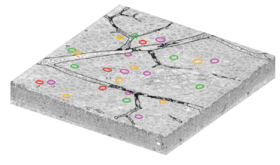 The colored circles mark the locations of On-Off Direction-Selective Ganglion Cell. These direction-selective ganglion cells (DSGC) fall into four types, which are each selective to one of the four cardinal directions, and are marked by four colors (magenta, green, red, and yellow). Image of the retina from serial block-face scanning electron microscopy (SBFSEM). Scale bar = 100 microns. Immediately after 2P imaging, the retina was fixed, stained, and embedded in a hard plastic resin. An unconventional stain was used to mark the boundaries between neurons while leaving intracellular organelles unstained. SBFSEM was used to image a volume of size 350×300×60 µm3 (left) with voxel resolution 16.5×16.5×23 nm3. Since the same blood vessels were visible in both the 2P and SBFSEM images, the researchers were able to find the same DSGCs in both images. These are marked by colored circles on the SBFSEM image just as in the 2P image above. Reconstructed ganglion and amacrine cells. In Panel a of the figure on the right, the gray scale image shows a cross section of the SBFSEM volume that is perpendicular to the retina. You can think of this as a cut through a sandwich. The filling is the inner plexiform layer (IPL), the top piece of bread the inner nuclear layer (INL) and the bottom piece of bread the ganglion cell layer (GCL). The IPL contains synaptic connections between the axons of bipolar cells, and the dendrites of amacrine and ganglion cells. The colored objects in panel a are six DSGCs reconstructed by the researchers. The circles are representations of the cell bodies, and the lines are "skeletons" of the dendrites. Each DSGC is said to be "bistratified," which means that its dendrites branch out in two sublayers ("strata") of the IPL. The total number of strata in the IPL is estimated to be around ten. A view of the bottom of the sandwich (panel b) shows the branching of the DSGC dendrites. 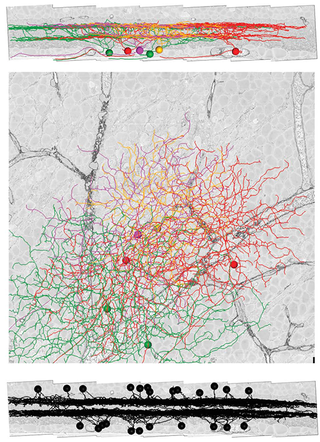 The researchers also reconstructed 24 starburst amacrine cells (SACs), which are shown in Panel c. These cells fall in two classes: ON cells (n=11) stratifying in one sublayer of the IPL, and OFF cells (n=13) stratifying in another sublayer. Comparison with panel a shows that SAC dendrites co-stratify with DSGC dendrites, suggesting that these two cell types could be connected by synapses. As shown in the images below, SAC dendrites and DSGC dendrites indeed contact each other. However, not all points of contact are synapses. The researchers conjectured that "varicose" contacts, at which one dendrite seems to grasp or embrace another, were actual synapses, while "incidental" contacts were not synapses. Varicose contacts (a,b) are synapses, as demonstrated by the presence of vesicles (b) in a conventionally stained dataset. Incidental contacts (c,d) are not synapses, as demonstrated by the absence of vesicles (d) in a conventionally stained dataset. Owing to its high resolution, EM reveals when a thin glial sheet is interposed between two neurons (e), a situation that would appear to be a contact point between the two neurons in a light microscopic image. From this analysis, the researchers derived a rule governing DSGC-SAC connectivity. All SAC dendrites and DSGCs respond selectively to ("prefer") motion in some direction. The researchers found that DSGCs tend to receive more synapses from SAC dendrites with the opposite preferred direction, which is evidence for specificity of connections. In principle, a DSGC could indiscriminately receive synapses from all neighboring SAC dendrites, which generally encompass a diversity of preferred directions, but this is not the case. The rule of connectivity suggests that a DSGC "inherits" its direction selectivity from its inputs, since SACs make inhibitory (sign-inverting) synapses onto DSGCs. This study was based on reconstructions of just 30 neurons in E2198. Clearly there is much more to be learned from this dataset, which contains thousands of neurons. This page was last modified on 14 June 2016, at 18:26.